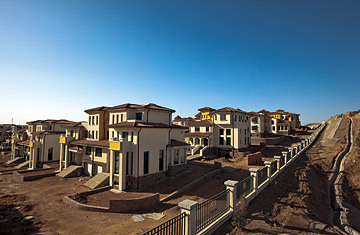 Recently constructed and unoccupied houses in the Kangbashi district of Ordos City, Inner Mongolia. No question keeps more economists, investors, hedge-fund managers and bankers up at night than this one: Is China's property market a bubble? The reason for their angst is clear: A property meltdown in China would imperil the whole world's fledgling economic recovery. Throughout the most severe global downturn in decades, China's economic growth has remained remarkably buoyant. This year, for example, China's GDP will likely rise 9% or more, in contrast to a merely subpar rebound in the U.S. and Europe.